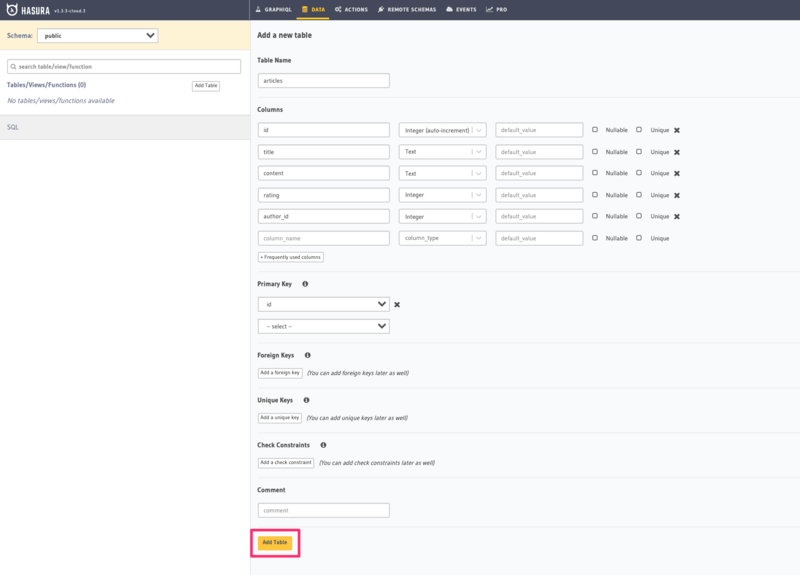 The Hasura GraphQL engine creates GraphQL schema object types and corresponding query/mutation fields with resolvers automatically as we create tables/views in the Postgres database. Let’s take a look at how to create tables using the Hasura console, a UI tool meant for doing exactly this, and what GraphQL schema it generates. Open the Hasura console and head to the Data tab and click the Create Table button to open up an interface to create tables. As soon as a table is created, the corresponding GraphQL schema types and query/mutation resolvers will be automatically generated. You can insert some sample data into the tables using the Insert Row tab of the created tables. At this point, you should be able to try out basic GraphQL queries/mutations on the newly created tables using the console GraphiQL tab (you may want to add some sample data into the tables first).